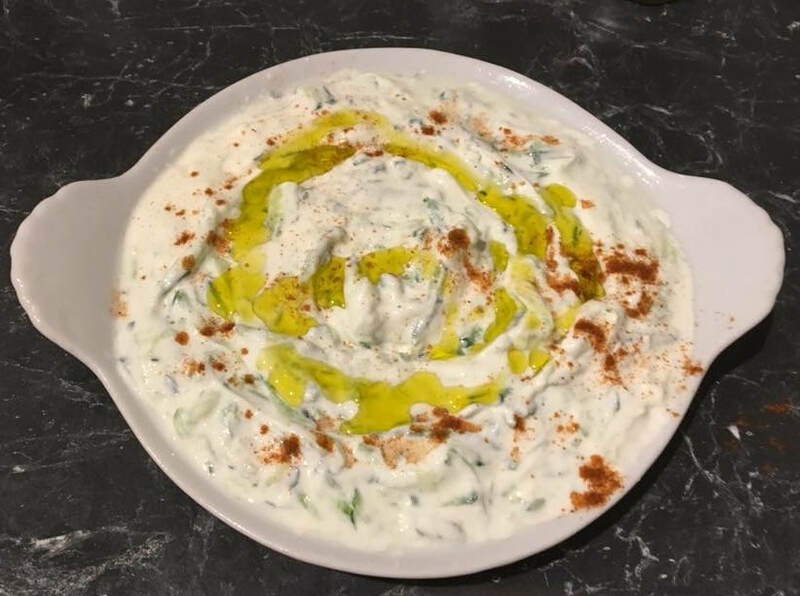 Tzatziki, is a sauce served with grilled meats (beef, lamb, chicken, it really goes with anything) or it is served as a dip. If I serve it with grilled meats, I serve it as is pictured above. If I was to serve it as a dip or as meze, just drizzle over some extra virgin olive oil and dust with a sprinkling of paprika as pictured below. Tzatziki can last up to one week in the refrigerator, but in our house, my daughter makes sure it doesn't last that long. You can find the marinated garlic recipe here. This has become one of my favourite things to eat. Preheat the oven to 180C/160C fan forced, place the garlic on a tray and roast for 15 minutes. Remove and allow to cool. Grate the cucumber, squeeze out as much juice as you can. Place the cucumber, dill, yoghurt, olive oil, salt and pepper in a bowl. Mash the garlic cloves on your chopping board and add the bowl. Mix the tzatziki to combine. Refrigerate to chill.